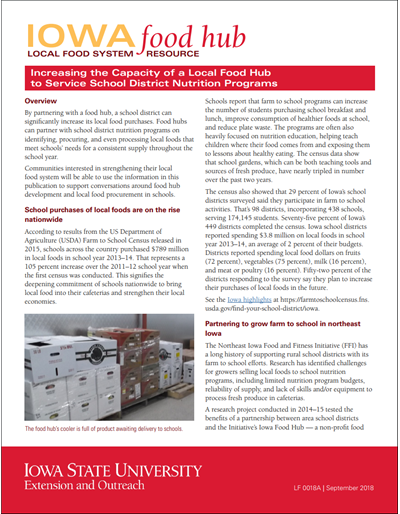 Searching for "marketing local food"
By partnering with a food hub, a school district can significantly increase its local food purchases. 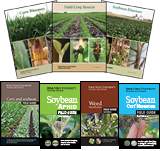 This publication provides information from a pilot program used to grow farm to school purchases in northeast Iowa. The scope, design and implementation of the project are all covered in detail. As new agriculture entrepreneurs consider producing and marketing food products and current producers seek new markets, they need to conduct preliminary research to determine if there are rules, regulations, certifications, or licenses required for their product or selected market. 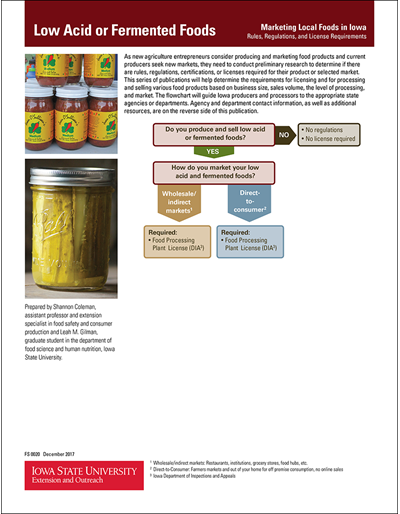 This publication will help determine the requirements for processing and selling low acid or fermented foods. 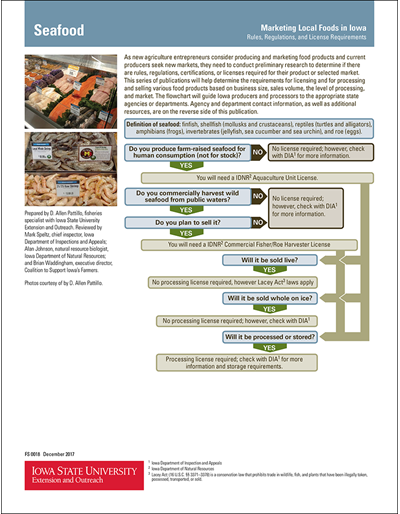 The included flowchart will guide Iowa producers and processors to the appropriate state agencies or departments. As new agriculture entrepreneurs consider producing and marketing food products and current producers seek new markets, they need to conduct preliminary research to determine if there are rules, regulations, certifications, or licenses required for their product or selected market. 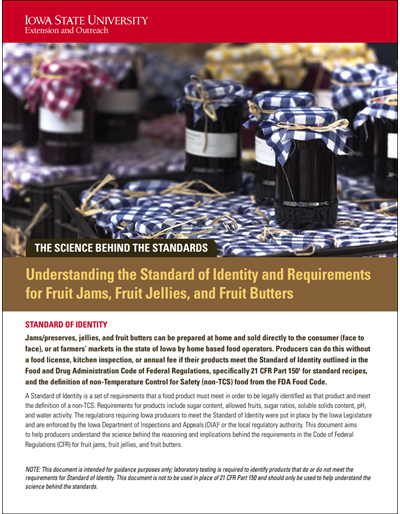 This publication will help determine the requirements for processing and selling jams, jellies and preserves. The included flowchart will guide Iowa producers and processors to the appropriate state agencies or departments. As new agriculture entrepreneurs consider producing and marketing food products and current producers seek new markets, they need to conduct preliminary research to determine if there are rules, regulations, certifications, or licenses required for their product or selected market. This publication will help determine the requirements for processing and selling fruit and vegetable juice. 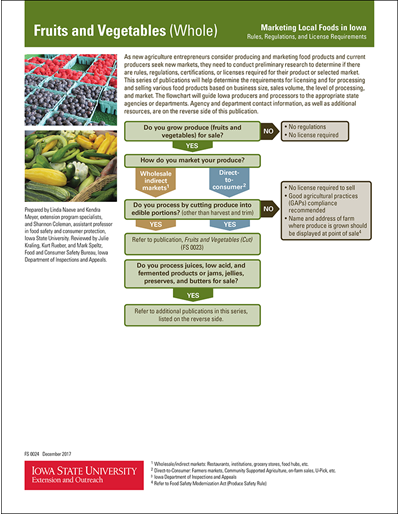 The included flowchart will guide Iowa producers and processors to the appropriate state agencies or departments. As new agriculture entrepreneurs consider producing and marketing food products and current producers seek new markets, they need to conduct preliminary research to determine if there are rules, regulations, certifications, or licenses required for their product or selected market. This publication will help determine the requirements for processing and selling cut fruits and vegetables. The included flowchart will guide Iowa producers and processors to the appropriate state agencies or departments. As new agriculture entrepreneurs consider producing and marketing food products and current producers seek new markets, they need to conduct preliminary research to determine if there are rules, regulations, certifications, or licenses required for their product or selected market. 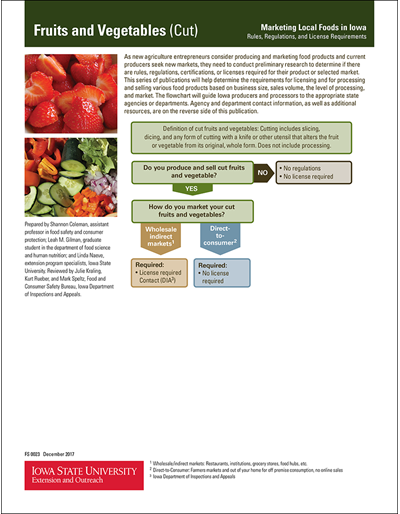 This publication will help determine the requirements for processing and selling whole fruits and vegetables. The included flowchart will guide Iowa producers and processors to the appropriate state agencies or departments. As new agriculture entrepreneurs consider producing and marketing food products and current producers seek new markets, they need to conduct preliminary research to determine if there are rules, regulations, certifications, or licenses required for their product or selected market. This publication will help determine the requirements for processing and selling honey and maple syrup. 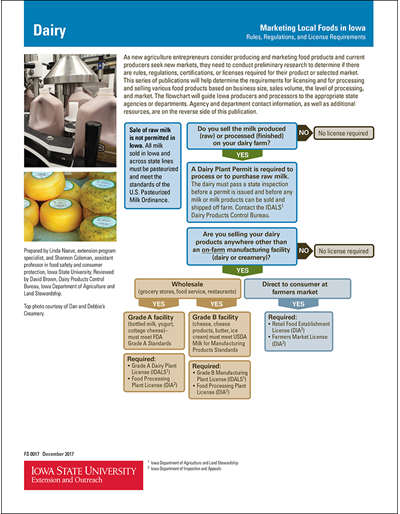 The included flowchart will guide Iowa producers and processors to the appropriate state agencies or departments. 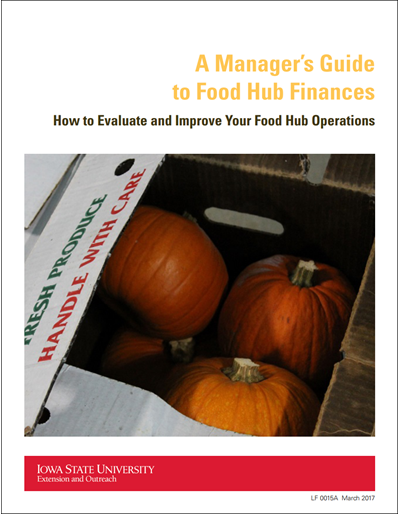 The purpose of this PDF guide (LF-0015A) is to explore how food hubs can use their own financial data to identify and address the strengths and challenges in their operation. Relying on data that most food hubs already have available in their financial records, we show how financial metrics can be used by managers to identify problems and risks and make decisions. The accompanying Excel spreadsheet (LF-0015B) provides an additional tool to calculate and interpret key metrics from a food hub's operation. In Iowa, more than 20 regional entities employ individuals as local food coordinators who promote the sale and purchase of locally grown food, provide regional capacity-building in local food systems and help build local food value chains. 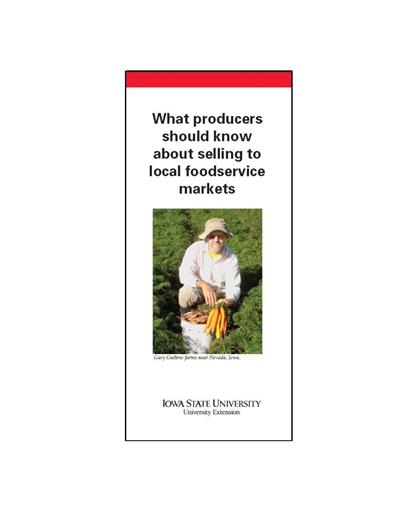 Iowa State University Extension and Outreach has begun a project to better understand the needs and challenges of local food coordinators, and to develop a program to better support both the coordinators and their supervisors. 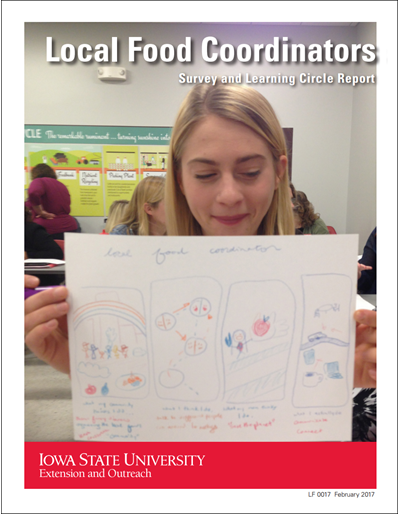 This report summarizes the project findings and outlines future plans for supporting local food coordinators across Iowa. Determining Factors for Local Food System Success analyzes the characteristics of factors that enable and hinder local food systems development within communities. Based on in-depth case studies of six of the most successful local food systems in the US, researchers present proven tactics for success in each of seven factors, or "community capitals." 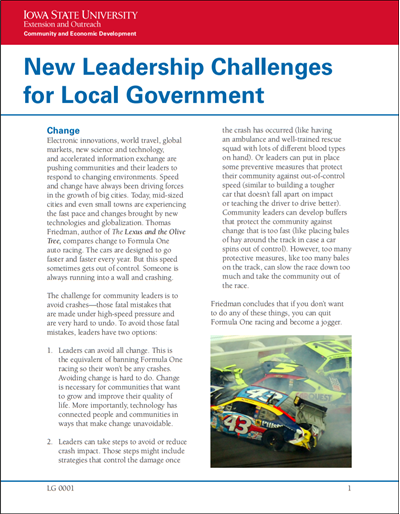 By using this guidebook, local food systems developers can identify resources and mitigate challenges in their own communities. Where and how food is grown or produced is of interest to consumers and retail foodservices; sustainable food production is a key part of this interest. 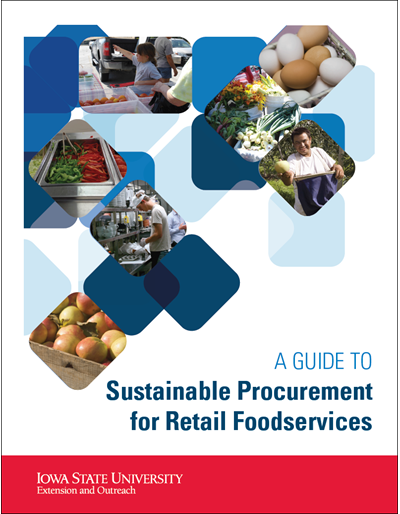 The Guide to Sustainable Food Procurement addresses food purchases that have positive social, environmental, and economic outcomes. 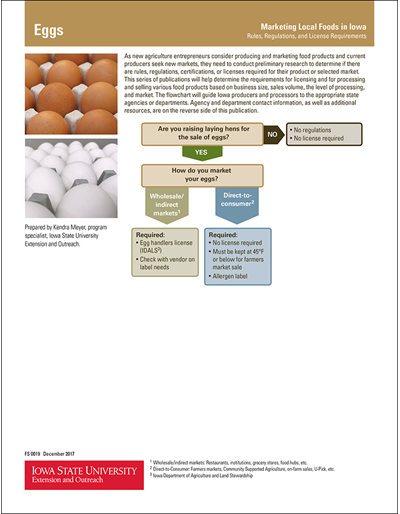 Organized into five sections, the Guide provides an overview about food purchasing and segments focused on four food commodities: fresh shell eggs, dairy, fresh produce, and meats. 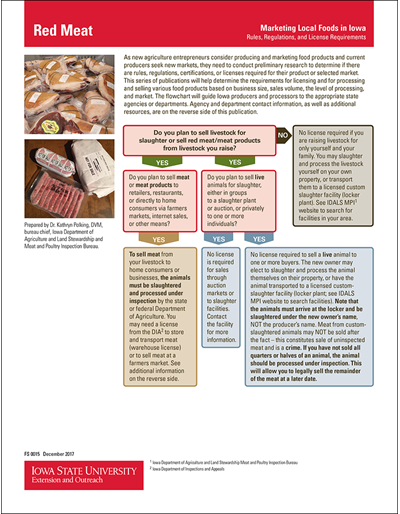 Each segment presents science-based background information about conventional and alternative production practices addressing food safety, environmental impact, social concerns, nutrition, animal welfare, and/or quality characteristics. 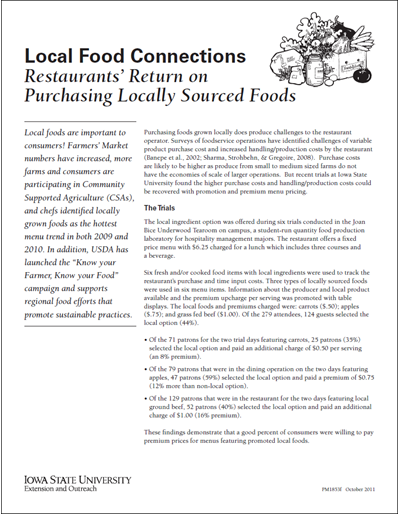 Part Three of this toolkit series lays out methods of funding a local foods organization. A variety of revenue sources are outlined, each depending on the legal structure of your organization. Discussed in this publication: in-kind gifts, membership campaigns and fees, merchandise sales, events, sponsorships, crowdfunding, grants, investors and loans. Information on organizations that are tax deductible is included. Budgets and fundraising are emphasized. Resources and practical helps in this publication will help take your idea from concept to reality. Foodborne illness outbreaks can happen anywhere and can affect a large number of people. 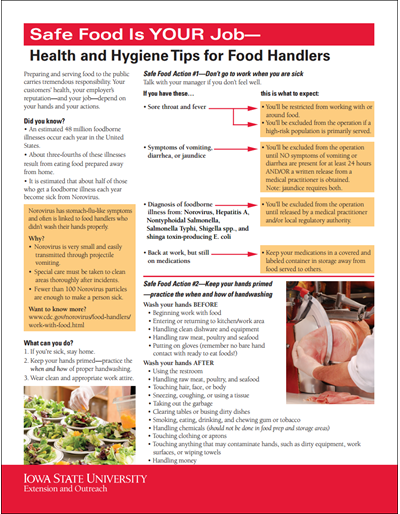 Follow these tips to avoid a foodborne illness outbreak. 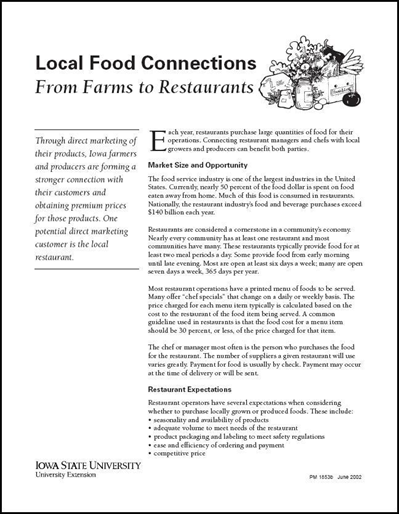 Individuals and groups rising up to meet the demand for local foods can gain practical help and insight for setting up their own local foods group, or gain ideas to improve the operation of their current organization. Starting off in the right direction by defining your organization, identifying core values, a mission and strategic plans is the first step in this series. Finding champions and developing a coalition of others who are a natural fit to support your efforts is outlined, along with helpful ideas for organizing managers and employees. Resources and practical helps in this publication will help take your idea from concept to reality. Part Two of this toolkit series raises key questions to consider while forming your business or organization. Descriptions of nonprofit, for-profit and cooperative models will help you determine which legal structure is most suitable for your organization. A checklist for forming a new business or organization in Iowa is included. Resources and practical helps in this publication will help take your idea from concept to reality. For food hubs, or businesses that aggregate and distribute local food, limited funds can be a barrier to growth. 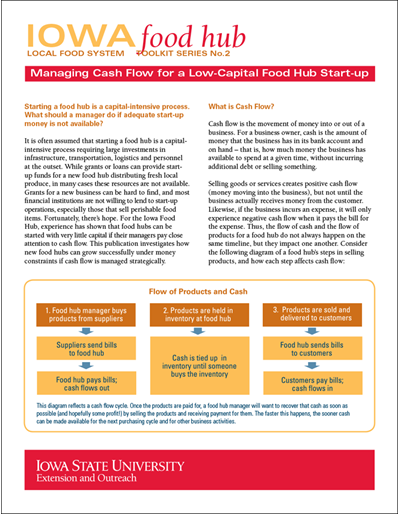 If food hub managers pay close attention to cash flow, however, they can grow their business using the income generated by the business itself, and reduce the need for grants or loans in the start-up phase. 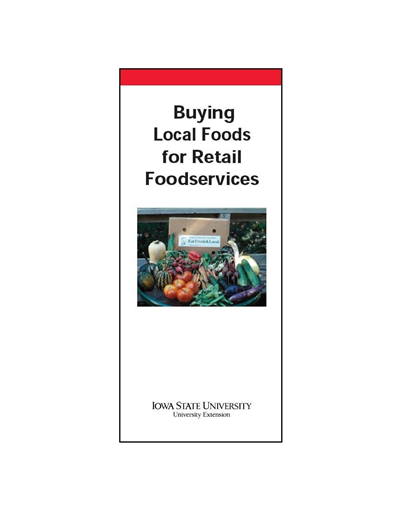 This publication explains the idea of cash flow and how food hub managers can use it to their advantage, drawing on the real-world experiences of Iowa Food Hub. Some food items used for student rewards and school fundraising activities send a conflicting message compared to what is taught about healthy food choices. Check this list of ideas for non-food rewards for elementary, middle, and high school students. More than 50 non-food fundraising ideas also are given. Supporting Local Food System Development in Your Community provides local government officials, community activists, and others with seven steps to help organize and promote the development of a local food system in your community. Selling a variety of food and beverages can be an effective fundraising activity, but only if no one gets sick. 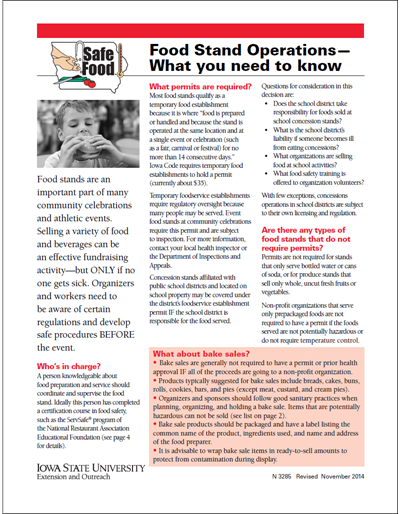 Find out what organizers and workers need to know before the event regarding regulations and food safety. 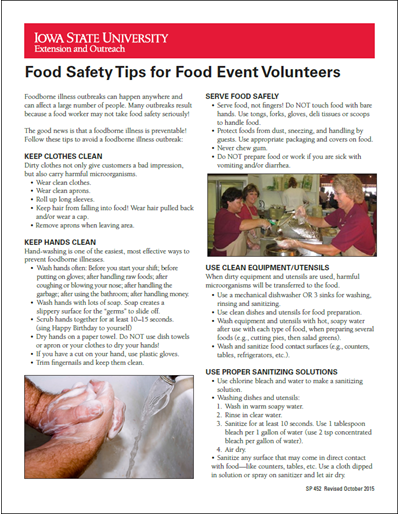 Outlines three actions for food handlers to take related to hand washing, staying home when sick, and wearing proper work attire. Local Food Coordinators support the development of local food systems by bringing participants together and increasing community awareness through educational and promotional marketing. This publication provides resources to groups and organizations who are developing a local foods coordinator position, complete with a position description. 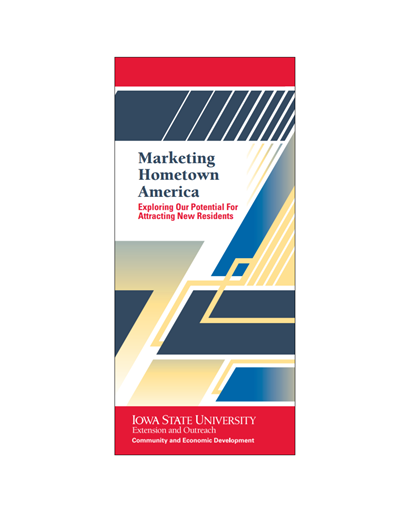 This publication provides a summary of Iowa Farm and Rural Life Poll research results on the role of farm families in local community philanthropy. What's a restaurant's return on using local foods? Learn about trial results that show people are willing to pay more for locally sourced foods when offered at restaurants. 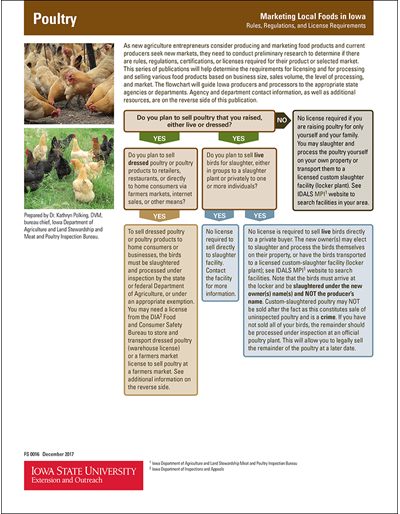 Details of safe food handling habits related to health, hygiene, and handwashing for all farm workers. 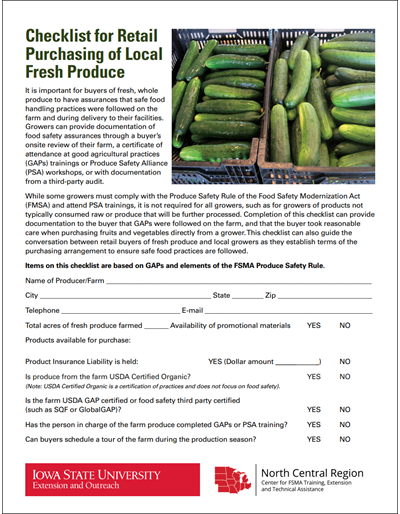 Farmers who want to sell their fresh produce will benefit from this checklist. It defines action steps to help protect their product, details to discuss with potential buyers, and suggestions for promoting their farm. Buying fruits and vegetables from local growers assures fresh product and helps the local economy. 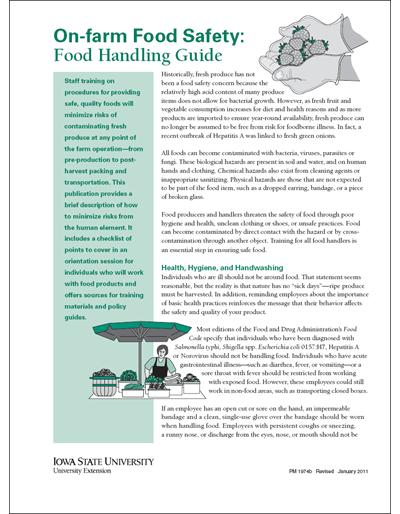 This publication provides insights needed to ensure the safety of food served, offers three action steps, and lists many additional resources. 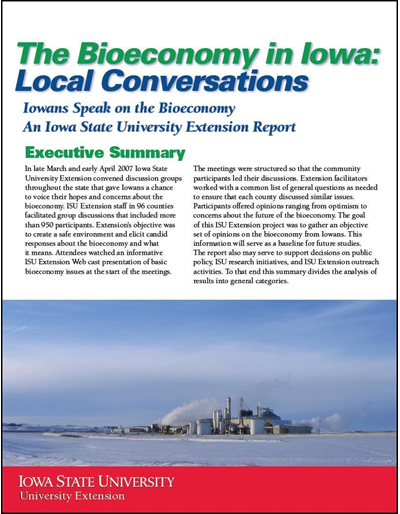 Report of citizen discussion groups held in spring 2007 in 96 Iowa counties regarding hopes and concerns about the bioeconomy. More than 950 participated in these Extension-facilitated meetings. 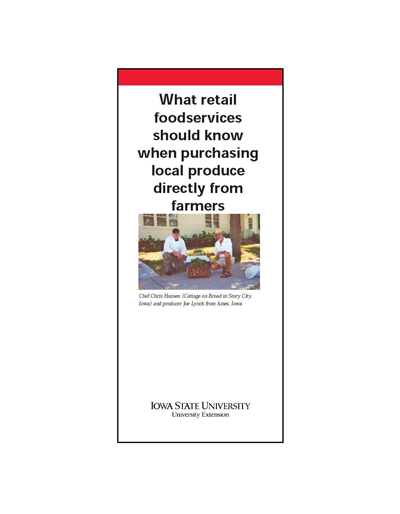 Report of an ISU Extension study of people who used food pantries in Polk, Scott, Decatur, and Monroe counties in 2002. Details of a research project that studied Iowa food stamp recipients who left the program in 1997. 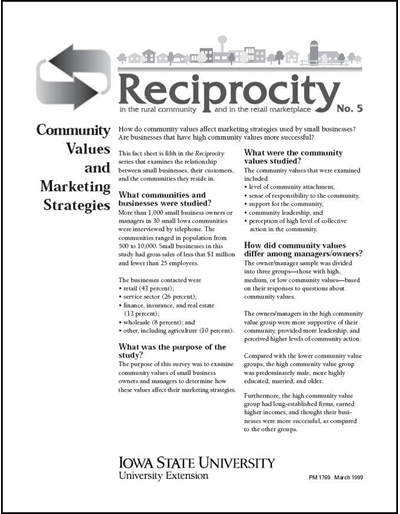 This publication, part of the Reciprocity: In the Rural Community and Retail Marketplace series, examines the community values of small business owners and managers to determine how these values affect their marketing.